Mentalism shows are geared for adults. Experience demonstrations of mind reading and psychic feats. Dan uses his psychological and intuitive skills to create a mysterious and memorable experience. Imagine guessing a winning lottery number or knowing the number on the dice. Dan uses volunteer audience members to make predictions in the picture shown here. 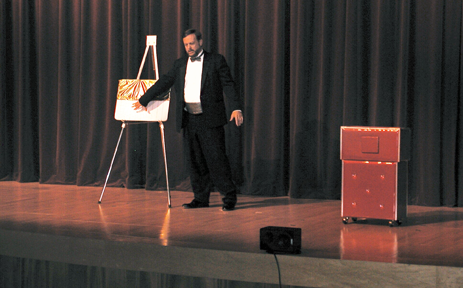 Mentalism is a favorite for Event Gatherings for adults.